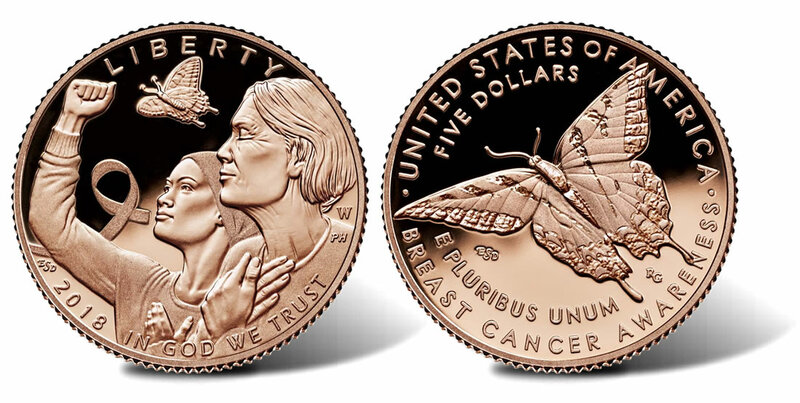 First-day sales of the six different 2018 Breast Cancer Awareness Commemorative Coins combined to 37,778, according to United States Mint spokesman Michael White. Released Thursday, available options include $5 pink gold coins — a first for the U.S. Mint, silver dollars and clad half-dollars in collector qualities of proof and uncirculated. Each of the pinks gold coins originally had an order limit of 1 per household. The Mint lifted those restrictions on Friday. CoinNews will publish photos of the coins next week. These low sales numbers are an absolute disaster. Doesn’t look like the BCRF charity will get a payout under the two specific terms of the BCA coin program public law provisions if this is the reflection of first day of issue & going forward. And, this is during the reduced price 30-day introductory pricing period too. Sad! Please make a separate donation to BCRF, if you are so inclined, as they are a worthy charity IMHO & had such high hopes for getting surcharges from the Mint but probably will not with these early very low sales numbers. Holy smokes folks, I did not think the sales numbers were going to be that low / definitely low but not that low. I wish mints would learn for the other mints / Jewelry coins do not sell. The only plus for collectors is the hope that sales stay very low thus keeping the populations of graded coins low. What a shame / such a worthy cause and they will not receive a cent / what a poor marketing strategy. The mint paid extra for all the $5 gold planchettes, think about all the waste. Dealer’s are/may likely to steer clear of this one for grading and resale if there’s no secondary market, after seeing these #’s. We’ll know come Tuesday if there was a pop in sales with the removal of the HHL, if not, this release is over. Old Collector: I find the mintage of the rose gold coins 50,000 to be low. Many world mints have set some bullion silver and gold at that number and they have sold like hot cakes lol sold out fast. Selling a coin below 9999 gold is tough at best. If they would have just added a rose gold touch to a 9999 gold coin to ensure the buyers investment / I believe they would have had higher sales / possibility of money going to such a worthy cause. Modern coins are tough to sell / so much international competition out there and collectors and investors have spoken load and clear – 9999 silver and gold only. Hope the mints listen cause at the end of the day, it’s our taxes dollars at work. Spring has sprung (almost) – where are all of the collectors of pretty butterflies? You get one on each side of these coins! & Happy St. Patrick’s Day! The only way these days to sell gazillions of coins is to announce ridiculously low mintage limits. Then they sell out in 3 minutes, to “flippers”. Announce reasonable limits and no one bothers. They don’t want it watered down with junk metal and an ounce should be an ounce and a quarter ounce a quarter once, etc. The prices are high for the mintage. I think the Mint has been striking out for some time now. Last year I made the fewest purchases I have made in a long, long time from the mint. This year is looking to be the same. This gold coin should not have been ALL rose gold. IMO there should have been only an area highlighted by it, and on the Silver coin. The premise behind the coin is admirable. The coin once again IMO, struck out. Obviously a very low population can lend a coin high future value, but if as is the case here the low population is not due to a mint decision but instead a general lack of buyers’ interest, then it essentially becomes more of a gambling-type situation. These coins could end up being priceless or they could becoming totally worthless; it’s all a “time will tell” proposition now. 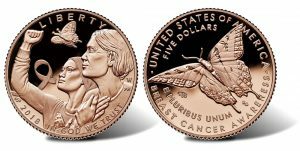 On both the WWI commemorative Dollar and the Breast Cancer Awareness coins I’m a much bigger fan of the depictions on the reverse of each, the poppies and butterfly respectively, than I am of that on the obverse; I guess I’m just a sucker for such beautifully-portrayed flora and fauna. When I first saw the design winner for the WWI coin, I too liked the reverse design only. I only bought the Air Service coin & medal set though because I don’t like the obverse design of the $1 coin. My father was in the Air Force the first 20 years of my life & we moved every 3 years so I had to have that set. And, I too really like the large butterfly on the reverse of the BCA coins. On modern world coins, I much prefer animals & plants over people for some strange reason. Luckily, there is a lot of variety out their from all the Mints. You can create your own numismatic zoo! There’s an “oops” up above in my final figure of the column. The Silver Value line item of the $1 Silver Proof should read correctly as “$12.69” rather than erroneously as “$14.10.” Sorry about that. Now try to figure out the intrinsic value of these copper-nickel clad half dollars that the Mint raised their prices on (& will increase in price by $5 each after the 1-month intro pricing period)!! A young collector on a tight budget might as well go buy a limited mintage 1-ounce .999 or .9999 fine silver bullion coin from any world Mint distributor for about the same price. $25.95 for the Unc. ($30.95 later) & $27.95 for the Proof ($32.95 later) is simply asinine for a clad coin with a mintage limit of 750,000. Plus, the $5 pink gold coins go up by $5 each after the intro pricing period too! Get that abacus out now & start crunching the numbers. After reading the crazy premiums on these coins, welcome to my mints world (RCM) lol Heavy premiums added to each coin. Don’t get me wrong, I love my mint but have not purchased a proof coin from them in over a year and have no plans to. The international market is strong with choice. When it comes to the price of these coins, I am with you Seth. Young collectors can buy a beautiful bullion coin at a fraction of the cost and have security in their investment. Isn’t there a major Catch-22 involved here in that while on the one hand a collector-grade coin is indeed a heck of a lot more expensive, on the other hand the much cheaper bullion coin version doesn’t come anywhere near to being collector-grade? It certainly appears to me that it boils down to one of those situations where one is inevitably of caught between a really big rock and a very hard place. Old Collector – You are right with most bullion coins compared to proof for them being collectible. Never underestimate the security of bullion or the ability for some to increase in value at a rapid rate / increased premium. The market expects not only quality with proof based coins but also security in the purity of the coins. Until mints figure this out, their numismatic divisions will continue to fail. O.k., now I finally understand what you’re saying. It is that mints have done much to improve the quality of their precious metal bullion coins but on the other hand have done very little – with a few rare exceptions – if anything to improve, that is increase, the precious metal content of their collector-quality coins. Therefore, unless and until the mints begin to change their attitude and subsequent ways in regard to the intrinsic value of the output of their specifically numismatic departments, those very proof and uncirculated divisions will have no choice but to continue to play second fiddle to their bullion sector counterparts and in at least some cases will actually find themselves struggling just to survive. Old Collector – That be the truth. Modern proof coins have been tanking in the market for years, this coin being a prime example. All major world mints have developed their bullion departments to feed this need. I rarely purchase proof coins anymore. To much choice in bullion and security with my investments. I will always love the balance between art and currency and purchase coins that make me happy / some proof. Not every coin is designed to be a winning long term investment, we collect what makes us happy. As a numismatist, historical coins and those that may become historical are what I lean toward. I still believe that this coin has long term legs, not for this generation, but the next. Sadly the initial price is killing it. I’ve copied and pasted my prediction from back in mid-February. Here are my predictions for the Breast Cancer Awareness gold coins. While hope springs eternal with collectors for sell outs and flipability(made that one up), past experience over the last few years dictates reality. With a Mintage Limit of 50,000 for both collectively. A sellout is not in the cards. at 24,916 proof and 6,674 unc. These last few years the legs seem to be in the MS/PF70s. Joe – the metal mixture is the only way to get the desired color the mint was looking for. According to what I was able to discern from further online research, the Mint had to put a MINIMUM of 85% of copper into their pink $5 pieces to achieve that hue; in fact, it is apparently not uncommon to include up to 25% copper to in order to achieve that pink color. Ironically however, if the Mint were to want to make a GREEN gold coin, the “additive” element would instead of the base substance copper be (pure, fine, 99.99) precious metal silver, thus resulting in a higher value finished item as a result. It does appear that once the Mint made the decision to release that $5 coin in “pink” (aka “rose” gold) instead of yellow gold, the result of ending up with a lower-gold-percentage coin was inevitably to be expected.. Exactly as you said it! P.S. – You’re always on the ball! Good calls there; very impressive! As to your considered opinion that the MS/PF70 grade coins might possibly be the only self-sustaining products in this regard down the line, it’s rather unfortunate if that indeed has to be the case; it would be really nice if coins like this were considered desirable enough to be worthy collectibles just coming “as is” from the Mint. This first pink/rose gold coin by the U.S. Mint is basically based on the famous “Black Hills Gold” of South Dakota jewelry popular for its tri-colors of yellow gold, pink gold & green gold all in one ring or necklace pendant etc. with the difference in colors being the different amounts of gold, silver, copper & sometimes zinc in the finished alloy. So once again we’re apparently stuck between a rock and a hard place (which these days is anything but unusual when it comes to Mint-related issues): If the mintage number of any given coin is enticingly low, the fracking flippers will scoop it up and it’ll be a sellout. If on the other hand the mintage number is extraordinarily high, hardly anyone will buy it and it’ll be a dud. What to do, what to do. I’m really getting a kick out of this discussion about how NOT to clean a coin unless you’re eager to meet your Maker pronto. Of course, the idea that a coin should never be cleaned at all in the first place has in the context of this conversation been left so far behind that it has entirely stopped being any part of the issue whatsoever; now it’s all about the basic human survival instinct instead! As Jim Morrison put it so well many decades ago, “Strange days have found us…”. Indeed, they apparently have! Rcvd mine today – dont see any pink-hue. Maybe early coins are unique and they forgot to “add” the hue – making it an “error” collectors coin! Lonnie V – was it the *pink proof or the *pink unc? & is the pigment to light or dark? btw! after what it did to the grass, & how deep into the soil it went, i* didn’t need to be told twice!*grin. Lonnie V – Sorry it didn’t work out for you; that IS rather unfortunate and surely disappointing. Joe Brown – Where you able to squint into that hole in the ground and see kangaroos by any chance? I agree that the coins are not pink and look like a copper penny.